Line a 25cm by 25cm square baking dish with baking paper. Clear a spot in your fridge for the slice to go when done. Crush biscuits in a food processor. Place the biscuits into a large bowl, add the Coco Pops. Melt the butter in the microwave, in 25 second bursts until melted. Add to Coco Pops mix, along with condensed milk and cocoa. Mix until combined. Place in baking dish and press down with the back of a spoon until smoothed out, and evenly distributed in the dish. Break the white chocolate into a bowl & heat in microwave in 30 second bursts. Stir each time, until smooth. Mine took one minute in total. Pour over slice, and smooth over with a smooth. 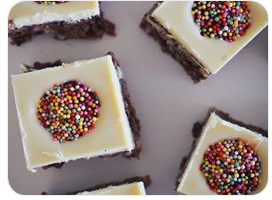 Place freckles on to the top of the slice. I did it evenly but you can do it as you please. Place in the fridge to chill and cut into slices with a sharp knife.